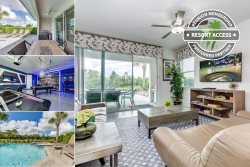 Located just minutes from Orlando’s theme parks, shopping, dining, and other area attractions, this luxury villa is located in Solara Resort. Solara Resort is just a 5 minute (2.7 mile drive) from a Publix supermarket and restaurants. This brand new vacation home will have 7 luxurious bedrooms for you and the entire family. There are 2 master suites with king size beds, one downstairs and the other upstairs, each with en suite bathrooms each with dual sinks. Theres another suite downstairs with a queen sized bed. Upstairs there are 3 other suites, 2 with king sized beds and one with two full sized beds. The last bedroom upstairs has 2 full/full bunk beds and is decorated throughout with your favorite characters. The downstairs master suite has private access to the patio area where you can relax the day away by the pool. On the patio theres furniture ready for you to dine al fresco and take in the fresh Florida air. Theres ample seating for everyone in the living room to gather in and enjoy a movie together after a day at the parks. If you feel like cooking up something delicious, theres a fully equipped kitchen. Theres additional seats at the breakfast bar, which is perfect for grabbing a quick snack before going out for the day. Upstairs there is a loft, which has some decorations to give you a true movie viewing experience. The garage has been converted into a game room with 2 TVs where you can play on either an Xbox One or PlayStation 4, as well as a pool table and an air hockey table that can convert into a ping pong table.